War is hell at the best of times, but it gets worse when the powers of Hell are directly involved. 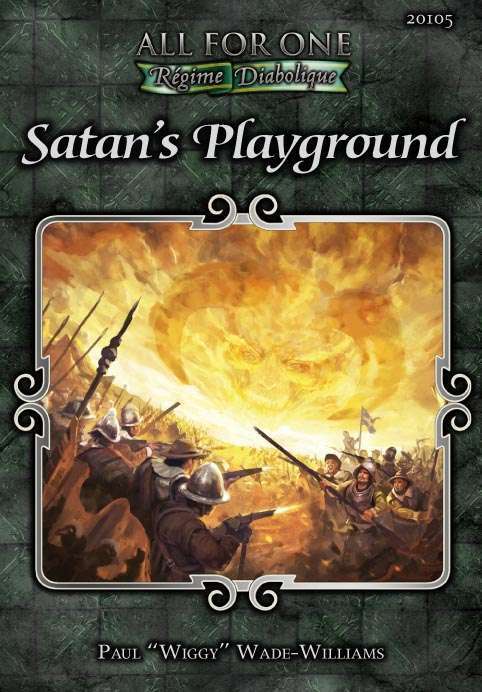 Satan’s Playground expands All for One into the Thirty Years’ War, a brutal conflict that is ripping Germany and neighboring lands apart. As survivors of the ever-expanding war, characters will face the ravages of plague, marauding armies, cruel mercenaries, Satanic cults, starving peasants who will sink their teeth into anything edible, and twisted fiends from hell. Contents include new character options, a history of the war as far as 1636, a gazetteer detailing Germany and her neighbors, rules for foraging and scavenging, diabolical mundane and supernatural threats, and advice for running adventures in a war torn land. Satan’s Playground requires the All For One Régime Diabolique RPG. All for One: Régime Diabolique is the award-winning musketeer roleplaying game from Triple Ace Games. This is great! Takes the Three Musketeers to a whole new level! Imagine, if you will, if Cardinal Richelieu's hatred of the Three (or Four) musketeers was caused by Richelieu being possessed by a demon or two? This would be a fine addition to any Renaissance campaign, and might make a good campaign all by itself! I highly recommend it! I was really looking forward to this but £13 for 95 pages including material reprinted from the Richelieu’s Guides and 13 pages of potted history means I will have to think again.